The connection of communication systems to the public network via SIP Trunking can be used instead or in addition to traditional PSTN trunks. Many VoIP Providers, also known as ITSPs, are offering corresponding services. The following article gives an overview of the SIP trunking features and limitations and lists the Providers, which have been tested and released with the enterprise platforms. The enterprise platforms have been tested with a large number of internet telephony providers that support SIP. Continuously new providers are tested, released and included within administration. As the SIP recommendations leave some room for interpretation, there are differences in the range of features supported with a specific provider. In this chapter general information is given which is valid for all platforms and all SIP Providers. Simultaneous VoIP connections depending on system and available DSL bandwidth, used Codec and system. G.711 needs up to 92 kbit/s, G.729A needs up to 36 kbit/s in both directions. The SBC takes care of opening the firewall for traffic with the selected VoIP providers. Attacks from other internet addresses are therefore blocked. Opening up the router's firewall would invalidate this security measure. Never configure SIP subscribers at a HiPath / OpenScape system without a strong password. Special call numbers (e.g. 0800, 0900, 0137) or analog fax/modem connections are not supported by all SIP providers. Emergency call numbers (e.g. 110, 112) are not supported by all providers. These connections must be implemented via TDM trunks. For DTMF transmission outband transport via RFC 2833/RFC4733 is highly recommended. The ITSP MUST support outband DTMF (RFC2833) if UC Suite functions via SIP trunk (e.g. auto attendant, voicemail control) shall be used. For DTMF transmission inband transport may be used, but the functionality cannot be guaranteed as endpoints (e.g. UC-Suite) may not support inband DTMF. For Fax transmission the T.38 protocol is highly recommended. The ITSP MUST support T.38 if UC Suite fax via SIP trunk shall be used. From ... UC Suite is able to proceed T.38 and G.711 faxes as well. An incoming ITSP call can be transferred or forwarded to another public subscriber via ITSP. Concatenation of such 'trombone scenarios' is not supported. So 2 lines (one incoming and one outgoing) are used while the call is active. The native SIP Subscriber interface is an open interface for SIP applications and can be used for the integration of other partner products after successful OpenScape Ready Certification. Such certifications are an essential requirement to minimize the project risks associated with integrating non- Unify products into our Open Communications solutions. The certifications confirm the functionality of the scenarios described in the relevant test reports, providing assurance to sales for quotes to customers in the field. In addition, the OpenScape Ready certifications guarantee that our support organization will provide service in case of faults in customer solutions, in which certified non- Unify products are included (Global Vendor Support & Development Support). Creation of a Change Request for OpenScape 4000 (incl. provider name, contact person etc.). The configuration and commissioning is coordinated with the SIP Provider Team. As soon as the basic connectivity has been established, further test cases from the OpenScape 4000 Interop test guide are carried out. When the interoperability tests are completed, a test report (including trace logs) is sent to the SIP Provider Team. The SIP Provider Team evaluates the test report and the traces. New released SIP Service Provider connectivity’s will be described in the Release Note for new Fixed/Minor Releases. In the Web Based Management you will find an individual SIP Trunking Profile for this SIP Service Provider. The costs for installation and testing must be borne by the region or project. Note: The LC, local region, or channel partner must ensure it has all of the necessary local technical resources with proper skills and training to perform the testing and to produce the required deliverables upon conclusion of the testing BEFORE beginning this process. If it does not have the resources to do this then an alternative would be to engage a CSL (by NPR process) to perform the certification testing instead. To initiate this process, the LC/local region or channel partner shall submit a PSR (via OSIRIS) to request support of the SIP trunk interoperability testing to be performed. Upon receipt of the PSR, the responsible Product Manager will obtain the necessary approvals from Unity Large Enterprise IP Development/System Test and Service HQ. The LC/local region or channel partner shall use the Unify Large Enterprise IP generic SIP-Trunk tests with SIP-Provider Test List as the MINIMUM set of test cases to be run. The LC/local region or channel partner shall also run any and all additional tests cases that are required by the SSP. This may include the requirement to execute a second complete test plan as supplied by the SSP. Testing shall be conducted in the LC/local region or channel partner’s test lab or at the customer site with the desired type and version of the Unify Large Enterprise IP platform and customer-premises SBC, using test resources supplied by the LC/local region or channel partner. All time and material costs for the testing shall be borne by the LC/local region or channel partner. Local service engineers and technical support shall be used for all necessary setup and testing. The LC/local region or channel partner shall use the latest software load released by Unify Large Enterprise IP Product House (on SWS) for the version of customer-premises equipment (e.g. platform and SBC) that is being tested. If problems (defects) associated with the Unify Large Enterprise IP software are discovered during testing, GSI.flow ticket(s) shall be created. Only legitimate defects reported by GSI.flow tickets will be fixed. If any enhancements to the Unify Large Enterprise IP software are required, for example, to develop a new configurable option or SIP method to allow interworking with the SSP being tested, an RQ will need to be created in TopInfo-R. If as a result of the testing fixes are provided to the customer-premises equipment (e.g. platform or SBC), or if fixes are provided to the SSP’s SIP trunk interface, the LC/local region or channel partner shall be responsible for re-testing the fixes as part of the interoperability testing and documenting the results based on the fixes in the test report. The responsible Product Manager will arrange to have the test report reviewed by Unify Large Enterprise IP Development/System Test. If the test report is missing required information or is otherwise deemed to be inadequate, the LC/local region or channel partner will be notified of the issues, and then they must fix the issues and resubmit the corrected test report. Once the test report is approved by Unify Large Enterprise IP Development/System Test, the submitter of the PSR will be informed by Product Management (e.g. by email) that the SIP trunk can be deployed in the customer project(s) and, if applicable, also be informed of any restrictions or conditions that may apply. This process (or another equivalent supported SIP trunk certification process) usually needs to be repeated whenever a new major release of the SSP’s SIP Trunk service or a new major release of Unify Large Enterprise IP platform version (or a different SIP trunk interface configuration, e.g. using a different customer-premises SBC) needs to be supported. Note: Since the SIP trunk interface supported by Unify Large Enterprise IP platforms are designed to be backwards compatible with previous versions, repeating this (or an equivalent) process for a new version of the Unify Large Enterprise IP platform (assuming the SIP trunk interface configuration is the same) may be waived if recertification is not mandated by the SSP. In this case, a PSR requesting a waiver together with a certificate or written statement from the SSP indicating that they accept the previous certification as being applicable to the new release of the Unify Large Enterprise IP platform needs to be submitted (via OSIRIS) for approval by Unify Large Enterprise IP Product House. ISDN International Format is the recommended way for SIP numbering configuration. As it is not the default configuration for all service provider it needs to be ordered from the provider separately if applicable. The main SIP trunking functions of the enterprise platforms have been tested with the following Internet telephony providers. 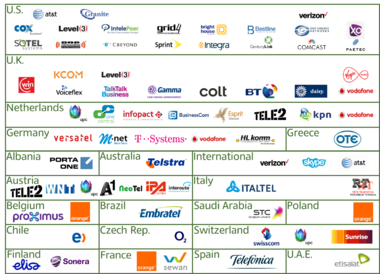 For detailed information see the document Overview about Released SIP Providers below. Skype Connect is a fee-based business service from Skype. It allows voice communication between Skype clients and office phones using the standard SIP trunking interface. Other Skype client features like chat or video are currently not supported. Our enterprise platforms have been officially certified by Skype. This page was last edited on 3 April 2019, at 10:48.